I really like this photo from the weekend. Pamilya Egg still going strong, in a manner of speaking. We've all continued to grow in our respective ways and we're not quite the same people we were when this "family" started. But I love who we are and anak will always be a very important friend. You don't let go of people like him. 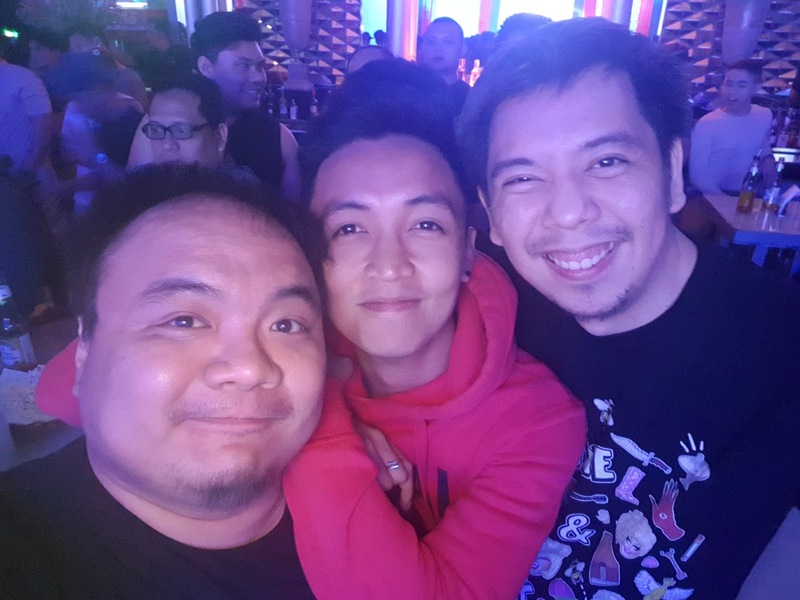 My first foray into the "gay world", in a manner of speaking, involved Malate and the different clubs there. And much like the then newly popular Queer as Folk TV series, the Malate of the time tried to capture the club lifestyle that stressed the need for dance floors and all that fun stuff. And despite my lack of coordination and my relatively bigger (read: fatter) size, I also got into dancing. Dancing is always be fun to me as it's a way to cut loose a bit or just celebrate a really good song or even a really good feeling born of a great evening with friends. When Tobie and I got together, our early excursions while we were dating already involved the cramped dance floor of O Bar in Malate. It sort of reminded me of my early days of dancing at Bed when it (1) still existed as a bar and (2) was much smaller than its final incarnations. But there was one big difference. Every time Tobie and I would dance, and this is true until today, he'd be dancing with me. Or let me add some additional stress there: he'd be dancing with me. And I say this as some weird revelation as in the past dancing was just something fun to do in itself. I tend to dance with my eyes close since (1) I like to focus on the music and (2) I'd often be dancing alone. Sure my boyfriend was just around the corner or dancing on the ledge but it didn't always feel like he was dancing for me. Tobie always makes sure to dance with me at the bar. Sometimes it may even appear that he's isolating me a bit or pushing other people away but in the end it's more that when we dance we only have eyes for one another and the rest of the bar no longer really matters. And while we both still dance with other friends we're hanging out with at the bar from time to time, I never feel alone and I know (and I'm sure he also knows in turn) that he's there for me and I'm there for him. And sooner or later he's going to make his way to where I am and dance with me. And after so many years it still makes me smile and feel a little giddy even. And that's a feeling that I hope never goes away and I honestly doubt it ever will. It's just another little thing that is worth celebrating. That's what Baduy Pride is all about after all - gushing over every little thing that makes me fall in love with Tobie all over again. Baduy Pride by Tobie Abad and Rocky Sunico is licensed under a Creative Commons Attribution-NonCommercial-NoDerivs 3.0 Unported License.